But just in case, I thought I’d get this on the record first – for the sake of the mental exercise and in the fractional hope of a positive result. “The nearest I can get to a “solution” to both Scottish and English demands for “home rule” that doesn’t explode almost instantaneously into chaos and vitriol is a properly federal wholesale reconfiguration of how these islands are governed – a writing of Britain’s unwritten constitution. This would entail , as a minimum condition of success and minimal durability, a full “granting” or “devolving” – or, more properly, “acknowledging” – of popular sovereignty within Scotland as an autonomous democratic entity. This fully autonomous “region” of the UK then devolves “back” an agreed package of powers over matters agreed first by consensus and then by a democratic mandate at some future date. The details of the powers and responsibilities probably need to be taken at a properly informed and briefed constitutional convention after the 2015 election which then seeks a specific mandate for its proposals at and through the 2016 election in Scotland. No less heated or fraught a forum is available. But the specific packages of proposals on proportion of taxes etc etc on offer at the moment look more like a poker game with Smarties than any serious attempt to address constitutional anomalies which can only properly be decided in detail and then put to a popular vote to receive a mandate. I am not suggesting another referendum to approve the “package”…rather that this mandate be specifically sought and staged in 2015 and 2016. It may yet be possible to create a package of “principle ” in time for 2015 that then mandates the convention whose conclusions can be included, or not, in the parties manifestos in the Scottish elections in 2016. In any eventuality, the Scottish people must give a fresh specific mandate to fresh specific powers. To pretend that the recent No vote did that in any but the most superficially legalistic and wholly symbolic sense, and then to expect that “settled will” to be permanent, is several degrees past wishful thinking. On principle, however, I believe that only a permanent transfer of constitutional “power of decision” to Scotland would both reflect the sea change implicit in recent events and go some way towards marrying the aspirations expressed by the two largest political parties in Scotland. It seems clear even at this stage that any consensual package agreeable to all three main Westminster parties that retains all decisions over further devolution in Westminster’s exclusive gift cannot be stable, even if it is capable of being stitched together in a “let’s pretend” way for the 2015 election. So there we go. That’s what I’ve sent in this morning. On reflection, it’s rather like applying for a really important job in the full knowledge that you won’t get it. At least you’ll know, when they give the gig to some knob head, that you tried. First of all ,thank you for giving me, and my fellow countrymen and woman this opportunity to have an input into this commission. A few days before the referendum vote on Scottish independence, the Scottish people were subject to a late intervention by the three main political leaders of the UK, and ex prime minister Gordon Brown, making Vows of “extensive more powers” and using rhetoric such as federalism, and home rule, and all this set to a strict timetable. In my opinion and backed up by polls, this intervention swayed the vote in favour of a no vote, after all the yes vote only needed a five percent swing to declare independence, to me this is a clear mandate from the Scottish people for extensive powers to be devolved to the Scottish parliament, or they wouldn’t have voted in such a way. The question is what does extensive powers actually constitute? Or to look at it from another angle what do the people of Scotland expect? Recent polls show unequivocally that the vast majority of the population of Scotland expect nothing less than so called “Devo Max” this being total devolved powers apart from defense and foreign affairs. The British government were given the opportunity to have the option of Devo Max on the ballot paper which they rejected, so why the late intervention vowing more powers, i can only conclude they were in danger of losing the vote, I believe the only way to bring my country and it’s people together as a contented nation is with Devo Max, thus keeping to the vow, thus upholding the expectations of the majority..
No need to worry, absolutely nothing wrong with your letter. I didn’t write to Lord Smith, so thanks for putting some of my thoughts forward with your contribution. Peter, your article highlights an important issue – as much as devo max was never on the ballot, so was a ‘no change’ option. A no vote was not a vote for keeping everything exactly the same as every single unionist party offered to devolve more powers from Westminster to Holyrood. If the Smith Commission fails to realise that the entire political scene in Scotland supports some form of further devolved powers then it will fall short. However, I notice that the BBC and mainstream media are still peddling this process as a divisive ‘them and us’ battle rather than a comprehensive discussion between parties. Your thoughts are good @tartanfever. Why not share them with the Smith Commision and the BBC and MSM. Dave, you pretty much hit the nail square on the head with that one. Excellent Dave. No one could slate this. Strangely I had similar thought this morning. What if both governments agreed to a treaty recognising the Scottish people’s sovereignty on one hand and those areas that the UK Government would administer for an independent Scotland? The treaty could be for an initial five years and then rolling forward each subsequent year for five years by joint agreement. This would allow the UK Government to maintain control of foreign policy etc for ten years minimum but longer if agreed and for gradual transfer of powers back to the Scottish parliament and the removal of trident. And of course no election of Scottish MPs to Westminster and so no EVEL problem. NB Scotland would have no input to foreign policy so no change there! Willie, I think the ‘sovereignty’ issue is a non-starter. Westminster is sovereign and thats a fundamental pillar of the UK establishment. It allows them to bring into law some hideous acts, like the recent ‘anti-social’ behaviour bill. Without it’s sovereignty, Westminster would come under some pretty extreme pressure from the public about such legislation. It would also throw up serious issues on the unelected House of Lords. Remember Westminster also have an ace in the pack. The 2011 AV referendum clearly showed that the UK public do not want electoral reform of any kind. 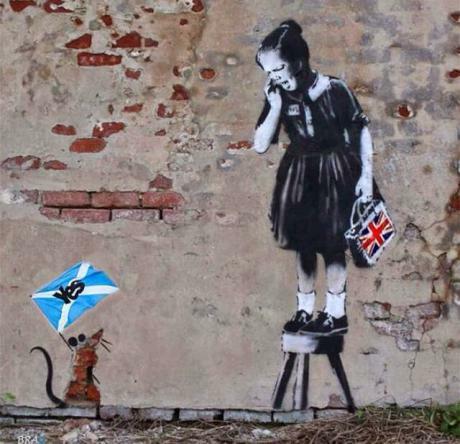 We said No to PR (granted AV is not the best option for PR) but in doing so we also said Yes to FPTP and British elitism – and that’s the whole of the UK, including Scotland. Fortunately for Scotland the referendum has generated a high degree of pressure for EVEL. This will not be fulfilled with any form of devolution! Sovereignty is much maligned and misunderstood term. It essentially means having the power to make laws. But there are several contradictions in that simple statement. Westminster (like so many state legislators) no longer has de facto sovereignty. London shares legal and indeed political authority with Edinburgh for a start with Scots law having a heritage status and the ability to ‘make law’. The EU has (see UKIP) apparently impinged on the sovereignty of Westminster and has under several treaties acquired substantial law making powers. Then the UN and its several agencies have produced a body of law (Law of the Sea, International Court of Justice etc) while bi-lateral and multi-lateral treaties create obligations, agreements and in some cases statute legislation governing trade, defence and financial agreements that together create a great body of ‘law’ that is not solely the jurisdiction of Westminster. We are now in the nuanced political world of the post-sovereign state. Now sovereignty is shared (European court) and indeed national sovereignty is given up in order to create new sovereignties of a much more pluralist character. The late great Scottish constitutional scholar, legal academic/philosopher and distinguished jurist (and an SNP member) Prof Sir Neil MacCormick has left a great deal of erudite writing on the nature of the post-sovereign state in his book Questioning Sovereignty. No doubt there are others who may shed a brighter light than mine on this critical constitutional question. When did the UK’s voters say ‘no’ to PR? As far as I’m aware, we’ve never been asked about PR for UK elections. The AV that we were offered, is quite a different beast from PR, and the reason we knocked back AV is that we could see that it meant next to no change for Westminster, which is why AV was all they were prepared to offer us. PR, which we might or might not have gone for, was never going to be on offer, because of the fairly large minority of seats (15%-20%, maybe?) that would go to parties from outside the LibLabCon cartel. True AV is not PR. The point I’m making is that whatever was put on the table was rejected by the UK public. There’s consequences to every decision, and the consequence of the No vote in 2011 is that Westminster now have no reason to make any offer of electoral reform for a very long time. ‘In 2011 the British public were offered in an open referendum the opportunity to vote for electoral reform. The reforms on offer were only a small step towards away from the system we currently use, however they were so overwhelmingly rejected (70% said No on a 46% turnout) that it’s obvious the public are in no mood for any change to our current system’. Electoral reform fell at the first hurdle in the UK, yes what was on offer was a trap, but in voting Yes it would have shown a desire for change which could be built upon. That opportunity has gone now. Oldbattle: True, sovereignty is not as simple as I’ve made out. However, in real terms, Westminster is regarded as sovereign because they pass legislation unhindered. True the legal systems in place in the UK can object and take action, but in general what Westminster legislates for is passed. Politics trumps law virtually all the time. For an example of hideous anti-democracy legislation passed without a hitch look no further than the ‘anti-social’ behaviour laws recently passed down south. You highlight areas regarding trade only. What about laws concerning citizen freedoms ? – you know, the important ones ! I came to same conclusions basically. UK as it existed is past its sell by date. Tweeking is not going to work and nor will faffing about. A major reconfiguration is required if there is any hope of keeping any sense of “togetherness” politically. But I don’t want Scotland to be forced to wait for a torturous process. We should be given home rule asap and then engage in discussion of what common sense says is best handles at the level of “group of islands” rather than “individual country”. Although, with the behaviour of the Westminster parties we have witnessed since Sept 18th, that commense list is getting shorter by the day. Basic fact: you can’t bully anything sentient into wanting to be in your self-defined version of “together”. A full federal system would be the ideal but this would take a long time and it seems most of England remains uninterested. Can’t see it happening so we are likely to end up with a wonky and perhaps unsustainable situation. Recent opinion polls (not the most reliable indicator, I agree) put support for an English parliament at more than 50%. Of course, nobody from the Westminster/Whitehall village or their media chums will say so. The fact that they don’t offer us a referendum along the lines of the one held in Scotland in 1997 is a pretty sure sign that they’re scared the result would be the one they don’t want. If the ‘wonky and perhaps unsustainable situation’ you foresee results in the kingdom breaking into its constituent nations, bring it on. What the referendum result shows me is that the majority of the Scottish electorate are conservative. The core of SLABS are the conservative working class. I do not believe that they have any appetite for increased Scottish self-government and I am by no means convinced that they will raise any objection if the outcome of the ‘vow’ is zero. Nor am I convinced that SLAB will have great difficulty in maintaining their numbers at Westminster following the general election. Plans are already underway to win the general election in the same way that the referendum was won. SLABS will sit tight, let the media promote their case and vote on the day to thwart any change. One of the best things that was achieved by pro self-government supporters was that our number was established. We know that 45 percent of Scots want change. Instead of going cap in hand to a commission we need to take the offensive – and I mean offensive. We need to stop being mealy mouthed and make it public that WE are not going to sit back and accept whatever is dished out. We need to make it public that WE represent the centre left in Scotland and we need to be scathing about what the Red and Blue tories stand for. We need to make it abundantly clear that 1.6 million Scots are not going to be treated as if we don’t exist. ABOVE ALL ELSE we need to make it clear that we are not begging but demanding change that will benefit US and that we will use every form of civil action known to humanity to ensure that we get it. Let’s get off our knees and stare calling them out. Being ‘respectable’ is right at the heart of the SLAB core voter. We need to leave them and those who represent them in no doubt that they are NOT respectable and specifically why. Making a scene is one of their pet hates and we need to ensure that they cannot avoid being right in the middle of one. Sorry Bella but this post reeks of servility and it is time for 1.6 million Scots to make it clear that the days of servility are over. Well said, but can I add that Mike Small in an earlier piece said it was a democratic decision, which it was not and we must all remember this. The introduction of the Vow resulted in the ballot being challengeable in court. It also produced a completely ambiguous result. We know that 45% voted for indepe dance but what did the 55% vote for? Exit polls say a quarter voted No to gain enhanced devolution. So we can calculate that 41% voted for the status quo and 14% for the Vow. Therefore, the core No vote may be as small as 30% when you exclude the feerdies! Having said all this, I am not persuaded that we need to pursue another vote, which could so easily be stymied, especially as I am persuaded that most people accept that independence is all but inevitable in the next twenty years. Far better to identify the vested interests that we threaten and tailor or proposals to ameliorate the threat. Hence my suggestion of Independence Light, which puts the UK Government in the negotiation driving seat. And of course they will be ably aided and abetted by the msm and BBC who will create a vacuum around the story. Music to my ears, but let’s be realistic. The WM government will not give in to federalism and loss of its sovereignty till forced. This would require honest disclosure of the true state of UK finances, so skilfully parlayed until now in the MSM into the idea that Scotland is a subsidy junkie, and not a net contributor. The real position is that separation of the finances would reveal a balanced situation for Scotland, and a massive deficit for England, causing a hitherto unprecedented financial crisis. Oh wad some power the giftie gie us, tae see ourselves as an honest, authoritative economist unafraid of government reprisals might do. Can I say first of all that Bella is made up of the people who submit stuff to it and doesn’t have a party line. I am therefore wholly responsible for my own views. Can I say second of all that I felt I had to submit something to Smith, even though its remit is predicated on the programmes of the Better Together coalition…See analogy of applying for job you know you’re not going to get. To call this being servile is ridiculous. It’s being engaged…and playing the ball from where it has landed. Point taken Peter, and you’re quite right. But I don’t see why your approach cannot go in tandem with the approach advocated (in general, undefined terms) by Arthur. It really is time for Scotland to stand up and stop being nice (=respectable). to quote an old poem I like from 1513, it’s time to “fight roughly, like the Irish Gael”. That doesn’t necessarily mean violence, but it does mean something more vigorous than election campaigns dominated by the BBC’s agenda. What’s to stop the Scottish Government setting up the structures of an independent state while we’re waiting, e.g. coastal patrol vessels to make up for the UK cuts of same, a central bank to make sure the currency issue fiasco is not repeated, and numerous other possible initiatives. Full fiscal autonomy Scotland was promised and full fiscal autonomy we should have, there is no need for a commission, the agreement was laid out by the “VOW” there is no going back , we need to have a fully devolved parliament with full tax raising powers including North sea oil revenue with Westminster carrying responsibility for defence and foreign affairs nothing more. NOTHING LESS WILL BE ACCEPTABLE!